If you’re a fan of Google Reader, like I am, that means it is now part of your life – something you’re not sure you could live without. I use Google Reader pretty much every day to read the news and keep up with the blogs that I can (mostly family, some friends). I love Google Reader. It’s easy to use, feature-rich, and keeps track of what I have read and haven’t. It even let’s me read my news on my cellphone (try it; it’s pretty slick). So, while I shouldn’t complain about this awesome software, there is one thing it doesn’t do that I’ve wanted it to do for years: open links that I want to read in a new tab without changing the focus using a one-key shortcut. See, Google Reader has lots of great shortcuts – though the only one I use all the time is ‘n’, which moves me to the next item. When I’m reading through Google News items, I usually read all the short blurbs first, opening the ones that really interest me in new tabs to read at length later (using a right-click with my mouse and “open in new tab” options in Firefox). Now, that’s really not that terrible, considering I’ve been doing it that way for years now. But wouldn’t it be nice to simply hit one key and have the items you want to read at length pop up for you to read later? 1) Install Tab Mix Plus in Firefox. Restart Firefox and you should have Tab Mix Plus installed. 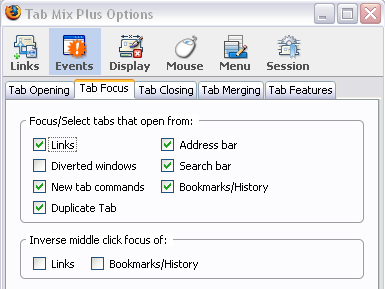 3) Scroll down to “Tab Mix Plus” and click on “Options”. 5) Once you’re done, go back to Google Reader, start reading, and when you want to open a story in a new tab in the background, hit ‘v’ and it should pop up in the background. 6) Voila! You now have a one-key solution to breeze through your Google Reader News faster than ever. this really helped me. i already had TMP installed, go figure!